Selecting the perfect car for you isn’t easy, even if you think you know what you want. These days, selecting a vehicle is as complicated as any appliance or electronic. You start off with research, trying to find owner reviews, comparing brands, checking prices, etc. It feels like the process could go on endlessly. Once you find a model you’re confident in, that’s when you discover there are a variety of trim levels, and you might be wondering if any upgrade is worthwhile over another. After all, you can’t go back and upgrade later if you find you can’t live without that panoramic sunroof. 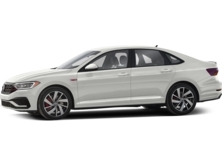 Here at Karen Radley Volkswagen, located just outside of Washington D.C. in Woodbridge, VA, we’ve put together a quick comparison of the different 2019 Volkswagen Jetta trim levels. The chart below will help you quickly compare prices and feature highlights, so you can be confident in your selection. You’ll notice that each trim goes up in price as you move along. This is because the features build upon one another. One thing to note for the base trim, S, is that the starting MSRP is for the six-speed manual transmission. The automatic transmission is an $800 upgrade, which still leaves a decent savings over the SE trim. Another thing to keep in mind is that pricing doesn’t reflect taxes, fees, registration, title or sales pricing. There are also available packages, such as Driver Assistance, which can bridge the gap between trim levels. So, how do you choose between trims? It’s a simple matter of weighing the prices and features against the other options. 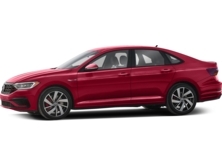 Aside from the 2019 Volkswagen Jetta R-Line, which has a unique appearance package, most features are going to build up from the trim before. This means that when you choose the SE, for example, it will have the more or upgraded features compared to the S trim. What we mean upgraded are things like the automatic climate control system. The S trim does have manual air conditioning, so you won’t be uncomfortable in the blistering heat, but dual-zone automatic climate control is more convenient. In this case, the feature would replace the other A/C system. Other features, like Blind Spot Monitor, are added on to the core list of features. 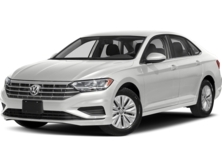 Still not sure which 2019 Volkswagen Jetta is right for you? 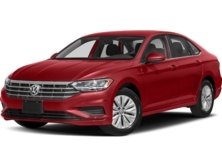 Stop by Karen Radley Volkswagen for a test drive. We happily serve customers from Tysons Corner, Vienna, Lorton, Springfield, Manassas, Woodbridge, Fairfax, Gainesville and Washington D.C.